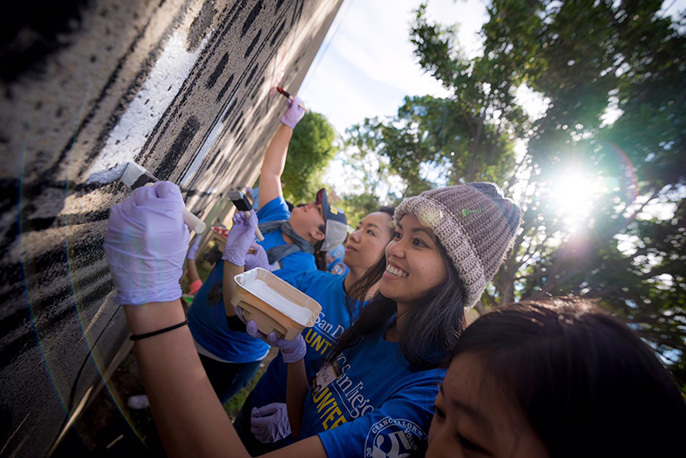 UC San Diego students volunteering for Martin Luther King Jr. Day of Service. The University of California ranks among the nation’s best colleges in serving the public interest, with six campuses making the top 20 and all nine undergraduate campuses in the top 100, according to Washington Monthly. The magazine today (Aug. 29) released its annual College Guide and Rankings, which assessed universities and colleges across the country on how well they improve social mobility, produce research and promote public service. UC San Diego ranked fourth overall and was Washington Monthly’s top-ranked public university for the seventh straight year. Three other UC campuses made the top 10 – UC Berkeley, UCLA and UC Davis – while UC Riverside and UC Santa Barbara also placed in the top 20. UC Irvine ranked 35th and UC Merced 41st, with UC Santa Cruz also making the top 100. Washington Monthly’s rankings consider such factors as the percentage of low-income students receiving federal aid, and the percentage of students who join the Peace Corps or engage in other forms of community service. Washington Monthly's focus on social mobility and service sets it apart from most other college rankings and elevates some of the important differences between public and private universities. Eleven of the top 20 universities in the Washington Monthly rankings have some taxpayer support. As a world-class public research university, UC tends to do well in college rankings, shining particularly in those that emphasize social mobility. For example, the New York Times called UC an “upward-mobility machine” for having six campuses in the top seven spots of its 2015 College Access Index, which ranked the economic diversity at the nation’s top colleges.